Of the 430 species of anopheles mosquitoes worldwide, just 30 to 40 transmit malaria, according to the Centers for Disease Control and Prevention. And among those, only the females do the transmitting. Female mosquitoes have different mouth parts that enable them to extract blood from mammals to feed their developing eggs. 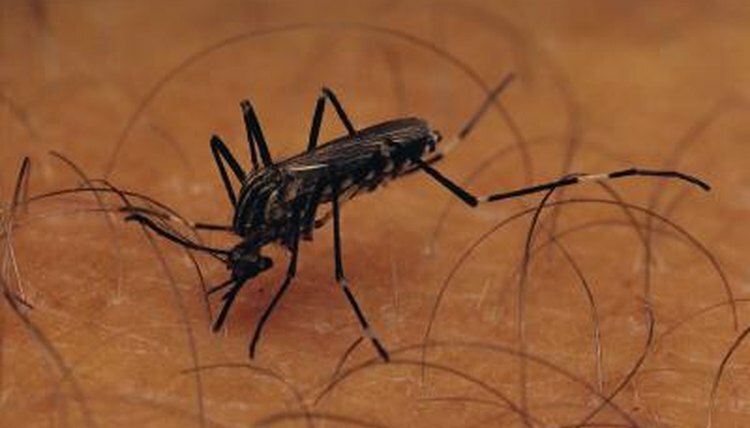 Male anopheles mosquitoes live just about one week in the wild as well as in laboratory conditions. Unlike females, males do not feed on mammalian blood. They use their proboscis or feeding tube to drink nectar from flowers. Males can be distinguished from females using as strong hand-lens or microscope. The male proboscis is wider and feathery when viewed under magnification. Female anopheles mosquitoes live approximately two weeks in nature and up to a month in laboratory conditions. Females seeks mammals, including humans, for blood, which contains the requisite amount of protein to feed her developing eggs. The female's proboscis, a long, thin tube used for feeding, is relatively smooth compared to the male's. It can only be seen under a magnifying lens or microscope. Female anopheles use visual, chemical and heat sensors to detect nearby mammals upon which to feed. They sense carbon dioxide and zero in on their prey, making a final decision about who to feed upon based on the quantity of CO2 emitted, octenol and other chemicals mixed in the sweat. Whoever emits the tastiest proportion in mosquito terms gets the most bites. Females use their probosces to probe the skin for a soft place to pierce, then insert the stylus or tip to find a capillary upon which to feed. It is at this point that the female can transmit the malaria virus to a victim. The CDC reports that anopheles species are found on every continent in the world except Antarctica. Although malaria is often thought of as a tropical disease, it is ever-present, even in temperate zones and in places where it was once thought eradicated. The highest number of anopheles, however, are within warm, moist climates in Central America, Africa, India, Asia and the Pacific Islands.